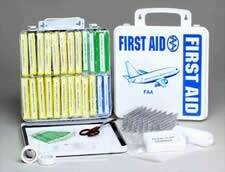 Aeronautical First Aid Kit, complies with FAA Standard 121.309. 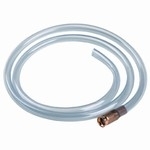 Available in either a Plastic or Metal dust and moisture resistant case ( 9" X 9" X 2.5"). Please specify your case preference when ordering. Metal case slightly higher..
Ammonia Inhalants, Plastic Strip Bandages, Bandage Compresses, Gauze Pads, Roll Gauze, Triangular Bandage with pins, Adhesive Tape, Wire Splint, Iodine Wipes and bandage Scissors.